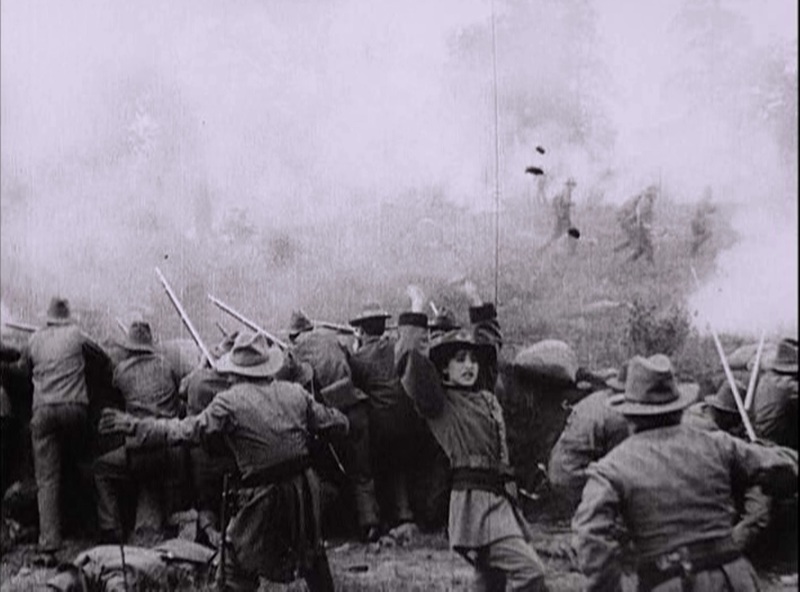 In some respects, this Civil War melodrama is a bit more of what modern viewers, familiar with D.W. Griffith mostly through “The Birth of a Nation,” will expect, than “In the Border States.” Its protagonists are loyal Southerners, the question of honor plays a central role, and the war itself is shown as implicitly justified, if a tragic necessity. There even is a white man in blackface portraying an African American servant, although his performance is not so explicitly racist as the “mulatto” or the role of “Gus” in “Birth.” It begins with a fairly lengthy tearful farewell sequence – a consistent way of introducing characters in these movies. Here, we get a heroic young son of the South (Henry B. Walthall, of “Birth of a Nation” and “The Avenging Consicence”) and his sister (Dorothy West, who was in “A Burglar’s Mistake” and “The Unchanging Sea”). The sister has two suitors, also going to war, portrayed by Charles West (star of “In the Border States” and “The Last Drop of Water”) and Joseph Graybill (who also appeared in “The Last Drop of Water” and “The Lonedale Operator”). General Robert E. Lee himself chooses Henry to be his courier with “an important dispatch,” but he panics at his first sight of death, and flees back to his mother. His sister, unable to bear the stain on family honor, puts on his uniform and dashes off to battle in his name. 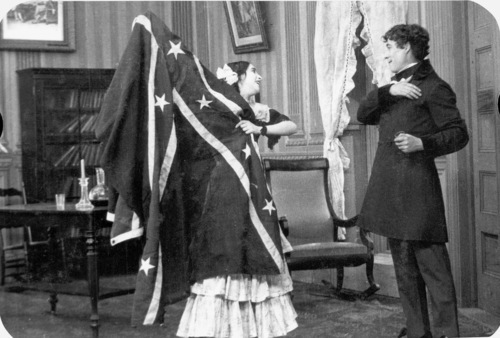 Of course, she is killed, trying to retrieve the Confederate flag she sewed with her own hands. Now the family has a deep, dark secret to hide. Their mother (Grace Henderson, who was in “A Corner in Wheat” and “The Usurer”) shutters the house and turns away the suitors, claiming that the sister’s grief is too great to be born, and the son begins a dreary life of hiding. Sometime near the turn of the century, he is at last found out, and he too, drops dead of horror and shame. The action scenes in this short film are nearly equal to the much-praised battles in “The Birth of a Nation,” although of course they are on a smaller scale, and there are some good chase scenes during the courier sequences. I think Ms. West acquits herself well as a woman warrior, with all the overblown enthusiasm and devil-may-care courage Walthall himself shows in the better-known movie. The final sequence has a Poe-like resignation to fate and horror, and at least in this case there is justification for the claustrophobically small, square set of the single room wherein the brother lives out his years of cowardly existence. Billy Bitzer’s camera is largely stationary, but in the outdoor shots he manages some creative compositions. It is really the editing that makes the story work, and at this point in his career, Griffith had worked out how to signal simultaneous action through quick edits between scenes, and to build tension by showing as much as was needed for as long as was needed. I didn’t find the story to be as moving as “In the Border States,” but it is certainly a good example of what Griffith could do effectively in the short format.